1. The tail end of the storm caused the most damage. 2. She didn't thank her colleagues until the tail end of her long leaving speech. 3. We didn't find out the name of the killer until the tail end of the story. 1. Tom left the meeting with his tail between his legs after failing to impress the staff with his plans for the future. Whale tails have a distinct pattern on their underside, much like our fingerprints. 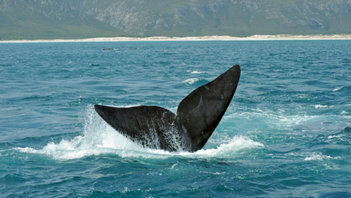 At 30 metres long, the blue whale is largest animal on the planet.